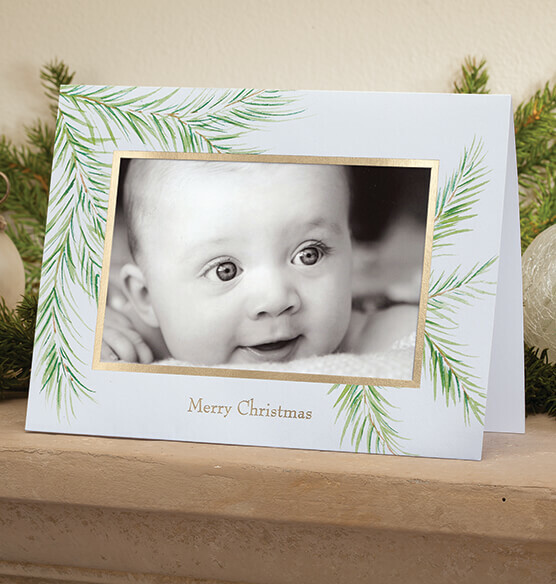 Beautifully understated, delicate wisps of hand painted pine frame your photo and evoke the spirit of the holiday season. This card offers so many possibilities when it comes to choosing just the right photo to go with the nature theme. Both sides feature watercolor pine branches in a subtle shade of green, and the gold foil border gives it a touch of shine. 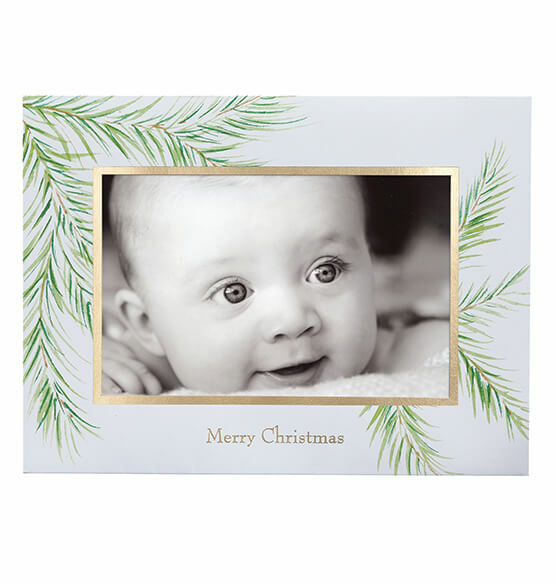 Slip a color photo or sepia black and white photo inside to create greeting card perfection. Inside, a lovely holiday sentiment is pre-printed in easy-to-read text. Add your own personalized text to enhance the verse, or leave it as is. Either way, this card can be a memorable keepsake for a lucky recipient. Pre-printed interior verse: "Wishing you a peaceful Christmas filled with laughter and love"
These cards were lovely and of excellent quality. I order Christmas cards from Exposures every year and have always been pleased. These cards are perfect for what I was looking for. They are beautiful, elegant and high quality cardstock. They make any picture look fantastic. Prettiest card I've ever had! I print my own photos and am very particular about how they look when inserted into the Christmas card. We mainly use photos from our travels, so we don't want a big distraction from the photo. This card was absolutely perfect. Beautifully designed and showed off our photo perfectly. I'm hoping for another winner for 2014! My son was married outside at our lake last summer. The colors on this card are so soft and a perfect complement to the colors in the wedding and the trees in the background. We have already received MANY comments about how beautiful our card is this year! So happy with this choice! A special thanks to the customer service person who helped me decide on this option! This is the second year we have ordered from Exposures -- and will definitely order again from you next year. Just a couple of comments for the product development folks -- the picture slips in the insert space during mail delivery -- wondering if there is a way to fasten it more securely without using folded scotch tape?? Also, the glue on the outer envelope didn't seem to adhere as well this year as last year...but with the stickers provided there was no danger of the envelop opening inadvertently. Thanks for your consideration of these possible improvements to a great product. I chose this design for my Christmas cards this year because it doesn't take away from our inserted family photo, but instead adds the finishing touch with the soft pine branches. I have been buying Christmas Card jackets from Exposures for years. I've never been disappointed. Thank you for keeping your quality consistent. The point size of the personalized imprint on all Exposures cards I've ordered has been too large. The point size should be much smaller and in an attractive font that contrasts nicely with the font used for the greeting, not the same font. As a long time customer I order my Christmas cards from Exposures.. This design will blend and enhance my Christmas holiday photo. I like it's simplicity; however I wish it didn't have writing on the bottom so the card could be horizontal or vertical. Should go well with the selected picture. I have ordered Exposures holiday cards for the past 10 years. I liked this design because it is so simple yet classy. Simple and elegant; nice greeting that's not politically correct. We ordered this card a couple of years ago when we had an outdoor background for our family picture and it was BEAUTIFUL! We have another outdoor background this year so decided to go for round two. Love your products! Have used this card for years. Usually include a photo of our children in a natural setting. The artwork does not overshadow the photograph and compliments many color schemes. Like this simple design for family picture at my son's wedding. Have been very happy with past Christmas card purchases from Exposures and hoping this will be same. 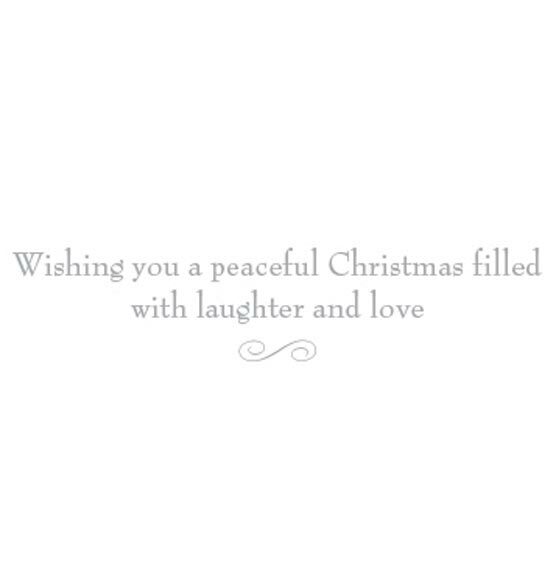 Beautiful design and lovely holiday sentiment. It is a simple look. I have ordered cards from you in the past and i was happy with the card quality. I wanted a personalized folded card so that I could put a real photo in it for my friends and family. Exposures had the best selection. Perfect compliment to a picture I plan to use with card. This is my choice for our Christmas card this year. I love Exposures cards. Beautiful frame for my images. Loved the simple Christmas message and wasn't to busy. Thought it would work with whatever picture I choose in the near future. Have always purchased Exposures Christmas cards for the past 15 years. I like to use personal photos for cards. We include a yearly photo of our twin daughters usually taken in our garden. This lovely card compliments, but lets the photo shine through. I purchased last year and was very pleased with the quality. I appreciate that I am able to place my own pictures inside the card so I'm able to personalize my message on the inside to each family/friend I am sending to. I needed a natural looking framed card to go with my bird photos. Nothing too shiny or ornate would look as good. I have been using this card for years! Friends love that it is classic and all about the holiday wish and picture. These cards are simple and elegant. We had outdoor family pics taken this year and this card will compliment them perfectly!!! Beautiful design. Used word Christmas. a more personal, creative greeting. Looking for a simple and elegant open frame in which to insert a family photo, colors will go with photo taken and work well with color or b + w photo. 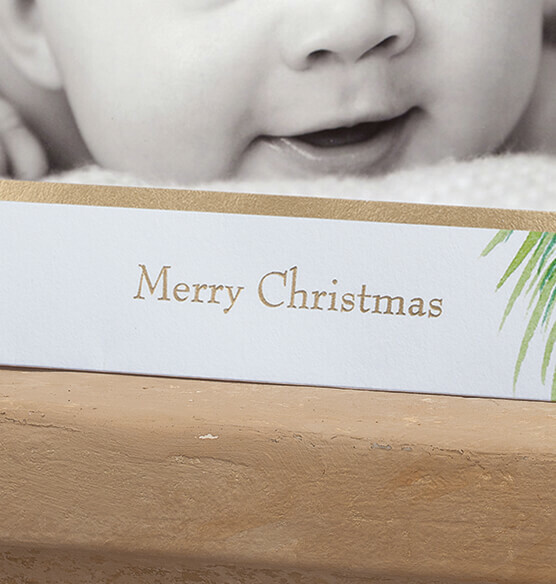 I have gotten our Christmas cards from Exposures for years and love the quality. Design complimented photo to be used. Also liked the message inside. because it was exactly the product I was looking for! what are the outside dimensions and the window dimensions of the card ? BEST ANSWER: Thank you for your question. For the requested information, please click on the specifications tab located next to the overview tab at the top of the description. We hope this information will be of help to you. what is the difference between regular set and card only personalization? BEST ANSWER: Thank you for your question. The regular set can not be personalized, while the card only personalization, the cards can be personalized. We hope this information will be of help to you. Does the envelope come with the regular set? BEST ANSWER: Thank you for your question. Each set has 18 cards and 20 envelopes.We hope this information will be of help to you. Yes, a set of very nice envelopes come with the christmas cards. They send 20 envelopes just in case a mistake is made while addressing the envelopes. Yes. It comes with a foil lined envelope, very nice and high quality! how does the photo fit into the card? BEST ANSWER: Thank you for your question. The card has a pocket to insert the card. We hope this information will be of help to you. Can Merry Christmas be omitted since I'm using the card vertically? BEST ANSWER: Thank you for your question. Unfortunately, the Merry Christmas comes printed on the cards. We hope this information will be of help to you. can I add the year below MERRY CHRISTMAS on the front of this card? BEST ANSWER: Thank you for your question. Unfortunately no, this item can not be personalized on the front cover. Personalization can only be added to the inside of the card. We hope this information will be of help to you. what size photo fits this card? BEST ANSWER: Thank you for your question. This card holds one 4 x 6 cards. We hope this information will be of help to you.